The Grossvenediger Ski Tour traverses through the Hohe Tauern National Park, enjoying excellent huts, quality skiing and making an ascent of Grossvenediger (3660m) – the highest peak in the area and 4th highest in Austria. This is a part linear, part star hut to hut tour, with a number of great ski summits and high quality glacier descents. The huts in the area are very friendly and welcoming, with hot showers, bar and restaurant service being the norm. I would like to second Ollie’s sentiments: a great and challenging week, huge fun… Dave also really had to think: how do I get this lot over to the other side?! He certainly earned his keep – many thanks Dave… Have not yet fully readjusted to life back on earth – still eating as if I am about to skin up 1300 metres before lunch. Slept quite a lot over the weekend! Firstly a big thank you to Dave for looking after us so diligently. Another wonderful and rather surreal experience … My conversation with Andrew suggests he was not a candidate for the London marathon yesterday after that one. But fantastically organised and executed… and despite the ignominy of arriving at the check in desk at Munich airport wearing a pair of bedroom slippers, looking forward to next year! 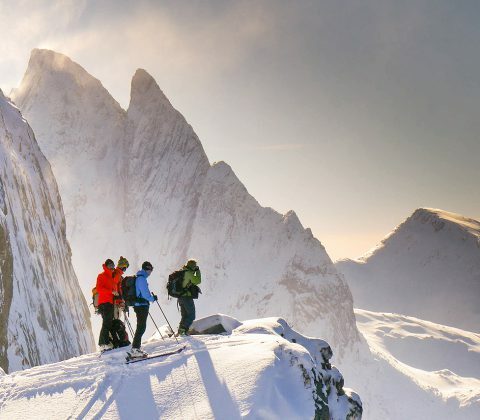 The tour is planned with flexibility in mind and ski touring is possible in the area in most conditions – however as always, stable snow and weather conditions are needed to complete the full itinerary. Two nights are spent at a couple of the huts, allowing lighter packs on some days. This is an intermediate level trip. To take part you should be at Fitness Level 3 and Tech Level 3 (see our Fitness/Experience guidelines below). You need previous ski touring experience to enjoy this tour. Typically there will be 900-1200m of climb a day, with options to make things more relaxed or more challenging along the way, so you can expect to be skinning for 3-4 hours a day. Type of ascent: we use 100% skinning on this tour – approx 6200m of skinning up, 6200m of skiing down. One UIAGM guide working with 6 clients. 2 nights accommodation in Innsbruck, including breakfast. Our base in Innsbruck is the excellent Hotel Weisses-Kreuz, centrally located in the historic old town near a good range of restaurants, an excellent ski hire shop, and with the airport service bus stop very close by. The staff are super friendly and helpful, and everyone really enjoys their stay in Innsbruck: it’s a great way to end the trip, seeing the sights and having a nice meal out in the town. Rooms are provided on a twin (or occasionally triple) sharing basis, but if you wish to book a single room please let us know and we will confirm availability. Any extra luggage not required on the tour can be left until the end of the week. Hotel details can be found on our Accommodation page. For overnights in the high mountains we will use mountain huts. The Austrian hut network is the finest in Europe – many have hot showers, a very well stocked bar, and the food is usually excellent. For more info please read the Using Alpine Huts article which provides an overview of typical hut facilities, average costs to help you budget for lunches/drinks, and general info on hut etiquette. The group will take a private minibus taxi from Innsbruck to the tour starting point, and back to Innsbruck on Friday after the tour, collecting/dropping off at the hotel. This will cost approx 70 Euros per person (return) and is paid directly to the taxi. This makes the whole travel experience a lot easier and more convenient, rather than organising individual public transport from the airport to the tour start point. You should arrange outward travel on Saturday, arriving by 6-7pm latest in time for the briefing at your accommodation. Your guide will run through kit checks and safety routines, as well as hand out any rental equipment, before going on to discuss the current weather and mountain conditions and how these affect our plans. We’ll have maps and guidebooks of the area to show you, so if you’ve any further questions or last minute requests, then this is the ideal time to bring them up. Overnight in Innsbruck. NB We meet in Innsbruck because it’s easy to get to and if you turn up early there’s good warm up skiing using the city centre funicular just 400m from our hotel. Onward travel to the Hohe Tauern is also much easier and quicker, as we are able to hire a private transfer minibus, rather than relying on public transport. AM Travel to Pragraten. PM skin up to the Essener Rostocker Hut. 800m of ascent to the hut ~3hr. Day Tour – Essener Rostocker Hut. A day to enjoy ski touring with a lighter pack on! There are numerous good day tours on the peaks and passes surrounding the Essener Rostocker Hut, many of which enjoy long and varied glacier descents. One such is a great circular tour around the Malhamspitz. From the hut the route traverses south, before climbing up the Malhamkees Glacier and then descending the Umbalkees Glacier. Finally, re-crossing the Reggentorl Col leads to an excellent long final descent back to the hut, that often holds powder. Grosser Geiger The Grosser Geiger (3360m) is one of the best ski peaks in the range and an excellent viewpoint. A long, but steady skin up the valley from the Essener Rostocker Hut eventually leads onto the west ridge and a ski depot. From here the summit is normally reached on foot, with some teams carrying skis to the summit to make a steep descent and others returning to the ski depot on foot, depending on conditions. Either way leads back the col to gain access to the long, north facing Obersulzbach Glacier which gives a great descent, frequently skiing powder. Finally, a short skin takes us up to the Kursinger Hut. Grossvenediger – the Grossvenediger (3674m) is the 4th highest summit in Austria and the principle summit in the region. The ascent from the Kursinger Hut is a varied and interesting glacier expedition, leading up to the summit ridge. Once on the ridge it’s usual to do the final 50m to the summit on foot, from where the views are outstanding in all directions. The descent is equally good – first crossing an open glacier plateau, before plunging 1500m down open slopes to the excellent Johannis Hut – this is very friendly spot and one of the oldest huts in the Eastern Alps, having been opened in 1857. The Johannis Hut is one of the oldest mountain huts in the Eastern Alps and a lovely spot to spend a couple of nights, enjoying another day tour with lighter packs on. Numerous different ski tours are possible from the Hut – our final choice will make best use of the current snow and weather conditions. Final Day – on the final day we a long, but well graded ascent to the summit of the Hohe Zaun, which lies a couple of kilometers away from Grossvenediger. The ascent is well worth it however, as it allows us to make the huge 1800m descent down to Innergschloss and the Matreier Tauernhaus – this is renowned as one of the best ski descents in Austria and the perfect way to finish the tour. PM return to Innsbruck, and final night in the hotel. Your trip starts and finishes in Innsbruck, the most convenient access point for touring in this part of Austria, on the doorstep of the Stubai, Hohe Tauern, Otztal and Silvretta ranges. The airport shuttle bus stops next door to our hotel in the heart of the old town, and just minutes from the city centre uplift too – have a quick ski on Saturday afternoon to kick start your trip! After a comfortable stay in Innsbruck, a private taxi transfer gives quick access to the mountains to start the tour. The most convenient way to reach Innsbruck in winter is fly directly to the city airport, then take a short shuttle bus journey into the city. Alternatively fly into Salzburg or Zurich and catch the train to Innsbruck. Fly to Innsbruck: check Sky Scanner website for best options. Or, fly to Salzburg or Zurich. Driving from UK, take the ferry or Eurotunnel to Calais/Dunkerque, then 12-14 hours driving.